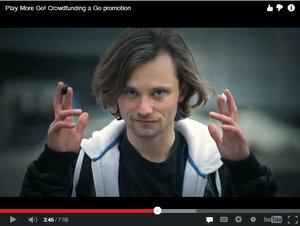 Two German brothers are collaborating to create a free movie trailer to spread the game of go. Sven Walther is a go player and computer scientist, while his brother Lars is an actor and filmmaker. Sven says he’s driven to “inspire people with interesting stuff” while Lars is “wowed by the stories and the drama in a game that appears to be so simple.” The brothers have teamed up to crowd-source $8,000 “to make a short video clip, like a movie trailer, to promote the game of go.” Rather than explaining the rules of the game, the Walthers intend to work with real actors and real movie people to create a professional clip that will create a “fascinating atmosphere to represent the game. The novice will see it and say ‘Whoa, what’s that game? Wanna learn more!’” They’ll make the video available on YouTube, so anyone “can use it to promote the game wherever you want.” With 50 days to go, the duo has already raised just over $2,200 in pledges. With several other professionally-produced shorts – the romantic French go video The Album Leaf Within Dreams (Go Art: Romantic Go Video 12/3/2012 EJ) and the 2012 European Women’s Goe Championship promo (The Red Dress Tesuji 8/26/2012 EJ) – already available, and the feature-length documentary The Surrounding Game now in production, a critical mass of go videos seems to be building.